By Matt -- What kind of old school would you like to be today, sonny? Digital dash type old school? DJ Jazzy Jeff old school? Headlamps that you must keep stocked with whale oil type old school? 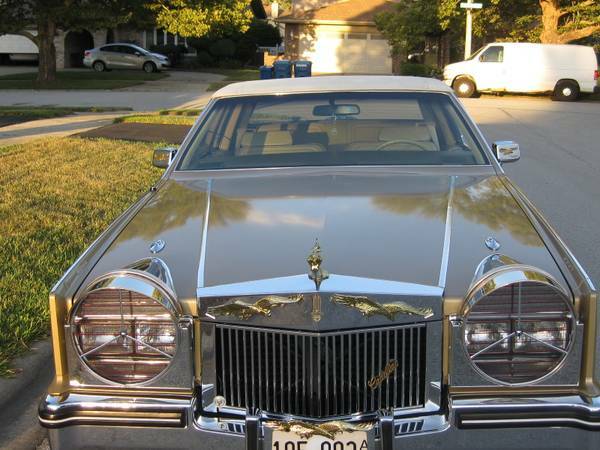 Seriously confuse your historic temporal sequencing with this 1985 Cadillac Eldorado with ‘Super Fly’ lights, which are apparently a thing widespread enough to earn a name, on craigslist in New York, New York for $14,000. Born to a family of Cadillacs who’s mailman was a 1927 Rolls Royce Silver Ghost, this Eldorado appears to have been part of a Pep Boys auto accessories captive product test fleet that was stolen and never recovered. I would actually believe that theory if the owner didn’t have a Plymouth Sundance and Lee Iacocca Limo subjected to the same stream-of-consciousness JC Whitney hotline ordering process, both sitting in the driveway. 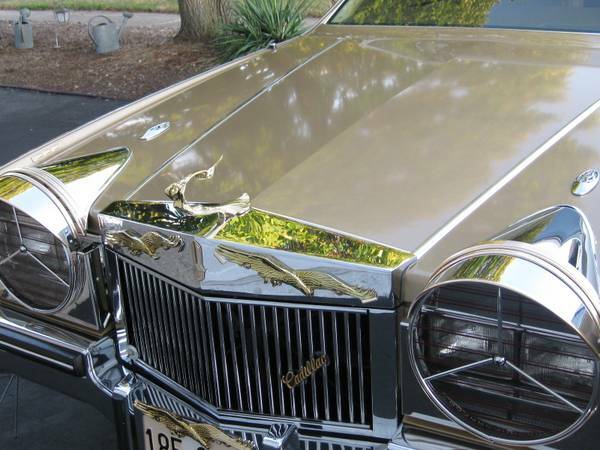 On the subject of accessory spares, this Eldo has two fake rotating assemblies mounted on the trunk for maximum protection against imaginary tire failures. A pair of screaming eagles on the grill are a reminder of the freedoms one has in America to ruin his vehicle in any way he damn well pleases. A Kitchen-Aide meat shredder attachment as a hood ornament also helps the whole cohesive nature of the package. Thankfully, the interior is nice enough that you’ll never have a good reason to get out and look at what you’ve purchased. The combo of big, steampunky, brass lamps and a digital dashboard has a Back to the Future III vibe to it. Similar to when the DeLorean wore whitewalls and got pushed back into the 80’s by a steam train. If in 1985 the train came through Hill Valley and leveled this Alternate-1985-Direct-Market Eldo instead of the DeLorean, we’d be in a much better place historically. "...if the owner didn’t have a Plymouth Sundance and Lee Iacocca Limo subjected to the same stream-of-consciousness JC Whitney hotline ordering process, both sitting in the driveway." I clicked on the link just to see that. Those K-car limos did not make much sense to begin with, and chrome-bombing one takes it to the next level of pretension. I was not disappointed. The only way this one could be improved is if it got the Donk treatment added on! What you have here is proof positive that you can in fact polish a turd, you can in fact install two Continental kits and 'super fly' headlight trims on one, but in the end you still have a turd. The asking price on this thing is pure comedy, though maybe there's someone out there who wants to relive the '80s he spent face-down in a bottle of Mad Dog. Ha! That's a great market assessment. The market for this car is further slimmed down as most people who have been face down on Mad Dog haven't come up, and if the have, they don't have five digits of money. I knew I could count on you guys to brighten my morning with this terrific find and entertaining write up. Bravo, Dante. Thanks for that. That whip in the background is not a Limo, gents. 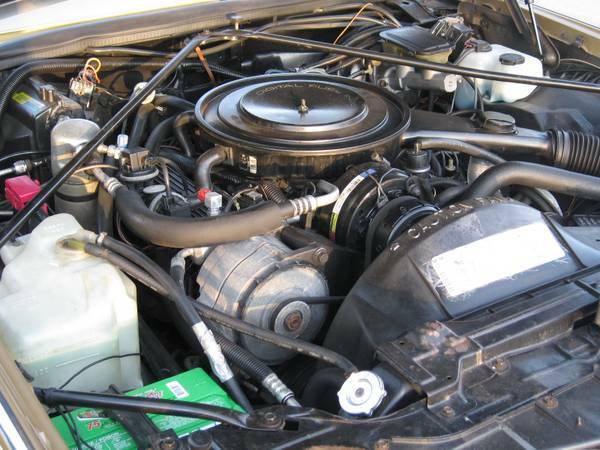 That is a standard issue Chrysler New Yorker, circa 1983 - 1988. Well, with some of the same additions that it's big brother Caddy is wearing as well. I washed, waxed and applied Rusty Jones paint protectant to my fair share of them, getting them ready for delivery during my stint as a porter way back at my first "real" job. 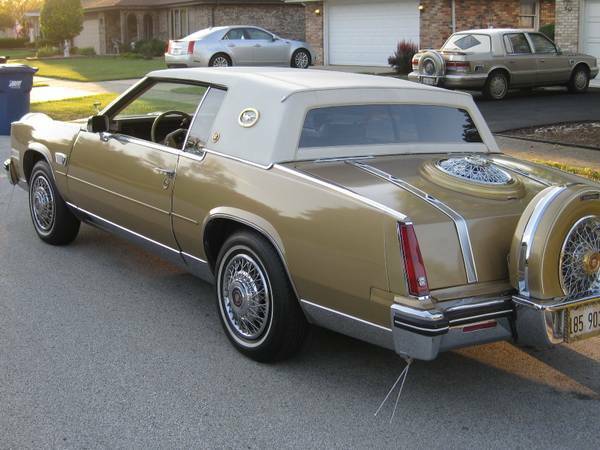 it's actually an '89-94 LeBaron, but my god it looks like the ghost of JC Whitney puked on the pair of them.